Plaintiff’s claim is on its face plausible, but so convoluted, that defendant may be able to break the chain. However, this Complaint, and others like it, are a reminder of the importance of keeping records of development, whether its a story as here, or a computer program or some other work, to be able to prove independent creation. Plaintiff’s Complaint does identify a number of similarities in between Gone Girl and Out of the Blue, and it will be interesting to see the defendants response. If there was no infringement, hopefully defendants have records to show the independent creation. On November 14, 2017, Arthur Alfred II, Ezequiel Martinez, Jr., and Tova Laiter sued The Walt Disney Company in the District of Colorado, alleging copyright infringement, and claiming that the Pirates of the Caribbean franchise of films, video games, theme park attractions, merchandising, casino games, literature and other related items infringe their screenplay of the same name. The focus of the Complaint is that the Captain Jack Sparrow character in the Disney productions is substantially similar to the character Davy Jones in their screenplay. Plaintiffs claim that Jack Sparrow is “an expression of a uniquely new ‘pirate. '” Interestingly, the “idea” of humorous pirates may have been the idea of the rides original designer, Marc Davis, who realizing actual pirates were not particularly glamorous, opted for a more whimsical and romanticized approach that was less threatening to younger audiences. Moreover Johnny Depp has claimed that his portrayal of Jack Sparrow was his own invention, and almost got him fired. The court will have to decide whether Jack Sparrow and Davy Jones are similar because they are embodiments of the same idea or because they share the same expression. Tannen sued CBS Interactive in February, claiming that the online division of CBS had used two of his photographs without permission to illustrate an article about high school football player Sofian Massoud. Despite being created by statute (17 USC 107) the only thing certain about copyright fair use is that it not as broad as everyone thinks it is. Grabbing pictures from Google image searches to make a point or make a joke is common, but not every such use is technically a “fair use.” Although the widespread use of images in this manner probably is broadening the definition of fair use. The Tannen v. CBS v. Tannen situation is a reminder that not all online uses of images are fair uses, and more importantly, if you are going to complain about something, you better not be doing what you are complaining about. In Waymo LLC v. Uber Technologies, Inc., [2017-2130] (September 13, 2017), the Federal Circuit affirmed the district court decision that Uber Technologies, Ottomotto LLC, and Otto Trucking LLC could not compel Way merely because they Waymo was arbitrating a related dispute with Levandowski, who did have an arbitration agreement with Waymo. are generally not bound by the contract, and a contract to arbitrate is not an exception. A party cannot be required to submit to arbitration any dispute which it has not agreed so to submit. The Federal Circuit noted that the California courts have, in a few situations, compelled arbitration against an entity that was not a party to an arbitration agreement. The Federal Circuit said that the issue was whether the circumstances are such that Waymo can be compelled to arbitrate on equitable grounds, in Waymo’s suit against Uber, Ottomotto, and Otto Trucking, where there is no agreement to arbitrate. The district court concluded that it could not, noting that Waymo had disclaimed reliance on the contracts with the employee, and Waymo need not rely on the terms of its written agreements merely because it makes reference to such agreements. compulsion to arbitrate is inappropriate. The Federal Circuit concluded that the district court correctly concluded that arbitration should not be compelled. Write as if your mother were reading over your shoulder. Consider the purpose of the communication. 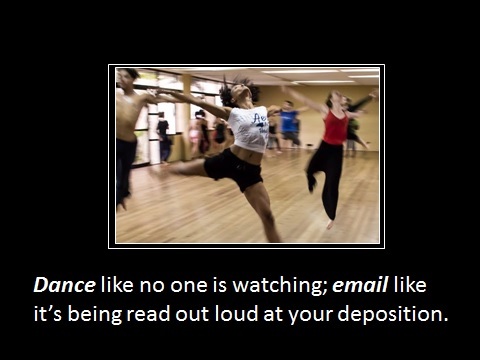 Consider the audience/recipients of the information (including a judge and jury). Be factual; where opinion is called for, identify it as opinion, and make sure that it is germane to the issues; do not give an opinion (e.g., legal) that you are not qualified to give. Do not make mean or demeaning references to others. Make your point, but avoid extreme emphasis!!!! Keep business and personal messages separate. Consider how your characterization of the Company and its activities would be perceived by an outsider. Anyone working in technology is familiar with the light year. It is not a measure time, but of distance — the distance that light travels in one year — about 5.9 trillion miles. In the world of intellectual property we should define another unit of measure: the lit year. A lit year, like a light year, is not a measure of time. Rather, the lit year is the typical spend in IP litigation in a year. The most recently published AIPLA Economic Survey reports the median cost of a medium ($2-$10 million) patent infringement case at $2 million. The 2017 PWC Litigation Study puts the medium time to trial in a patent case at 2.4 years. This makes a conservative estimate of the lit year at a little over $833,000. So what’s the use for the lit year? Like its scientific cousin the light year, the lit year is a bench mark that provides perspective. For example, a $350,000 IPR might initially sound budget busting, but if you consider that it is only 0.42 lit years — the amount you would spend in about 5 months of litigation — its starts to make sense. Similarly, a $20,000 new product clearance may seem like a needless expense but when you consider that this is just 0.024 lit years — the amount you spend in about six days of litigation, it sounds like a better idea. The lit year is a helpful tool in measuring risk, or more precisely the cost of reducing risk.